Today on Alphabet City: Jon Paul deals with the aftermath of a dog fight that leaves little Frida wounded. New excerpt available from Episode 14: And Baby Makes Three. 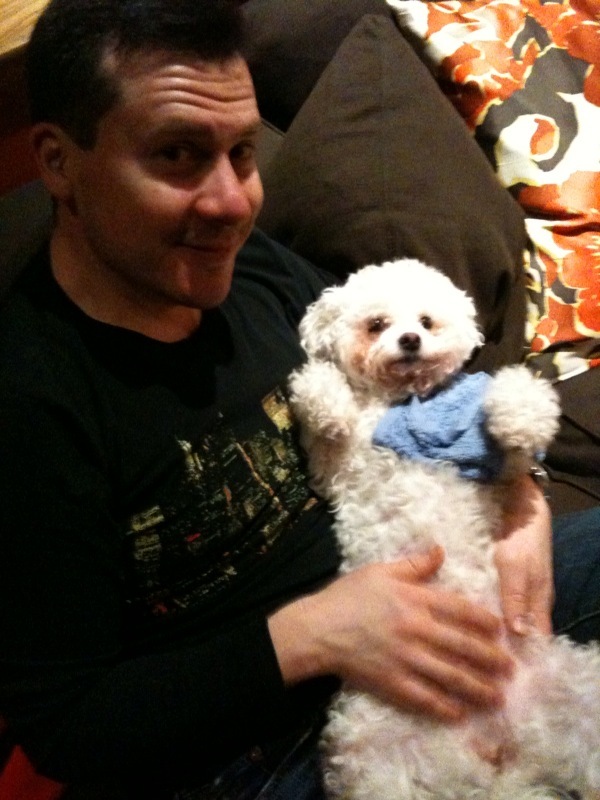 Last week, my foofy six year-old Bichon Frise dog-daughter Frida was roughed up and bitten by a bully named Flavia. Since I wasn’t present at the incident which happened in the courtyard of my house, details are sketchy. But from what I gather from our dog walker Andrea, in the blink of an eye, Flavia turned aggressive and sunk her teeth into Frida’s chest. That’s my girl. A complete Drama Queen. I’m proud to think she learned it from the best—me. Not to be all hot pants about it—Frida will be fine. There was bleeding, a pretty big puncture wound, and late night panic that an infectious fever had set in—I taught myself to take her temperature rectally following Googled instructions. The next day during a trip to East Village vet Doc Moscovich, Frida re-enacted the crime with her dramatic wailing before he even touched the gash. As if auditioning for a role on Law&Order: CVU (Canine Victim’s Unit), Frida trembles in panic every morning as we walk the streets near Flavia’s apartment. Yesterday, we spotted the accused and her owner who quickly looked away and shuffled on. I was astonished—if I had found out Frida had caused such an injury, I would be in touch with the parents immediately offering help for the vet bills, therapy, etc. I thought about going over to him and inviting him and his co-dog parent over to our house to talk it out. Suddenly, I realized I was recreating the plot of Broadway’s God of Carnage and casting myself in the role that won Marcia Gay Harden a Tony. On second thought, I decided to leave it alone—I’d rather my house not end up in ruins like the set of that play. Twice a day I force feed Frida a horse pill of an antibiotic and insist she wear an Elizabethan collar. But it’s the prescribed hot towel warm compresses that get me—she won’t sit still for me to administer that old school remedy. No, that’s a special bonding treat she saves for her Papa Chef. From the very beginning, those two have always had a special bond. Which is funny, really, because pre-Frida, Chef wasn’t really a dog person. In fact, I basically hoodwinked him into adopting the little goose. Here’s another excerpt from Alphabet City’s Episode 14: And Baby Makes Three—about how a puppy transformed two career-oriented NYC gay guys into doting parents. CLICK HERE for the second excerpt from Episode 14: And Baby Makes Three. Today on Alphabet City: Jon Paul’s celebrity hatred game becomes a Thanksgiving tradition. Since I moved to the Big Apple, Thanksgiving has become my all-time favorite holiday. Instead of traveling to spend stress-induced time with family, I gather friends in my home for a big meal. After we pile our plates with food and pour copious amounts of wine, we go around the table and announce the person we would most like to spit on. That’s right, we don’t waste time being sappy and thankful. Instead, we use it as an opportunity to vent frustration with famous faces. The Spit List as we call it has a long and storied history, having been created by Susan and me in our days at Condé Nast. CLICK HERE to read a full excerpt about the origins, including a peek inside the famed Condé Nast cafeteria, and a dig at Chloe Sevigny. Spitting on someone is a real commitment based upon a visceral reaction; it comes from the gut. There really is no rhyme or reason—so there’s no arguing allowed once someone announces their “spitee.” They are allowed to give some background, but not required to defend their choice per se. You can only spit on famous people—someone that you might see on a red carpet. It can’t be Bob in accounting. Your Spit List doesn’t have to be long, and people can move on and off the list over time. Scarlett Johansson was on my very first list, but has moved off. Friends who have enjoyed The Spit List game at my table report that it has become like a drug for them—they spend all year looking forward to creating their list. If they miss Thanksgiving at my house, they phone or email in their entry. Some have tried exporting it to their family gatherings with limited success. My friend Aimee spent some time in Liberia but was frustrated in her attempts to explain the game to citizens of a post-war torn republic. Over the years, we have had quite a diverse group of honorees—Jennifer Aniston has moved on and off various people’s lists; not surprisingly both Suze Orman and Oprah have appeared more than once. I imagine at least Oprah will be back this year. Last year, Angela tried expanding it beyond just celebrities to broader concepts like the “blogosphere.” The judges are still out on whether pop culture concepts will be a permanent category addition to The Spit List. This year I’m extra lucky—two of my perennial Spit List favorites have collided: the Vampires of Twilight and Dakota Fanning. I’m already getting choked up. Have a heartwarming holiday, and do report back on your own Spit List. Today on Alphabet City: Long before he takes real estate advice from an Oscar-winner, Jon Paul battles Japanese Power Rangers to score his first NYC apartment. Guest star: Marcia Gay Harden. As repeat viewers may remember, on last week’s Kitchen Knightmares I served a fishy dish to the editor of Washington Heights’ neighborhood newspaper. Well, turns out he survived to tell the tale—literally, he wrote all about it in this week’s Manhattan Times, the opening of the piece tells the story of how I found our current brownstone thanks to encouragement from actress Marcia Gay Harden. Reading it reminds me that I’ve always been blessed with good Big Apple real estate karma. While many young transplants spin tales of tiny Manhattan studios with tubs in kitchens, I escaped those nightmares when I first moved here in 1996. Instead, I did battle with costumed characters to score my first pad in the East Village. Here’s an excerpt from Alphabet City’s Epsiode 2: Will He Make It After All? Just like when Mary first arrived and battled Rhoda over an insanely well-designed apartment, I had a similar fight over my first NYC home—only not with my best friend. In my sitcom set-up, my pal from college Angela and I joined forces and battled a group of Japanese Power Rangers. 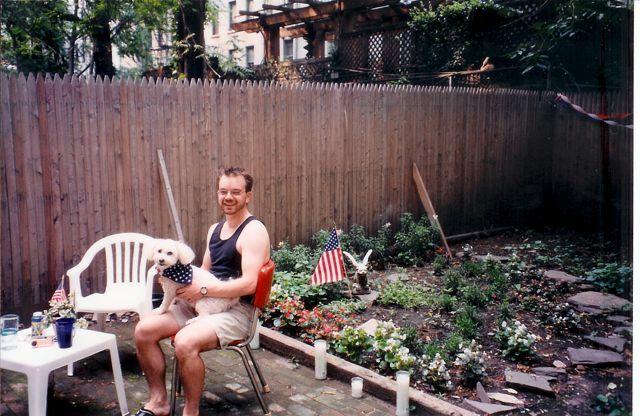 The East Village apartment we desired was in a newly renovated building, and while it was slightly more than we could afford, it had two levels, and a backyard, perfect for my foofy dog Winnie who was accustomed to carousing in her own grassy yard in Texas. Only thing standing between us and our new sitcom set were seven Japanese kids who had just graduated from high school, dressed head-to-toe in colored leotards with matching helmets, and flashing a wad of cash. Their parents were willing to pay the entire year’s rent up front. It was an offer that John the Greek landlord, just venturing into the realm of NYC real estate, could hardly refuse. Our shot at a fabulous pad was slipping away. But if there’s one thing I learned from Mary, it was a little charm goes a long way. I invited John the Greek Landlord to lunch—he looked like a guy who didn’t miss a meal. Over latkes and applesauce at Leshko’s Polish Diner just down the block, Angela and I asked John about his family. He beamed as he showed us wallet-size pics of the strapping young men. “It’s a very big Greek family. All my sons in the business with me,” he said. I wondered if any of them were single. “Well, I can’t wait to meet them,” I said. “Must be so wonderful with them being so close for you to look after them,” Angela added. “It’s so hard for us moving to New York from Texas, so far from our families,” I chimed in. I looked away out the window—like I was about to cry, when actually I was about to burst out laughing at the lie I was telling. Angela was certainly close to her family—but I was purposely escaping my crazy brood back in Dallas. My father’s parting words echoed in my head. I turned back to the landlord, and went for the close, ready to pick up the check, intending to pay with money I had borrowed for the apartment’s security deposit. I leaned in, looking him squarely in the eyes. While thinking about the cash the Asian superheroes were flashing, John looked at Angela, then at me—my eyes pleading with him for a break. He smiled. After dreaming about this moment for over 20 years, I grabbed the keys to my first New York apartment—and the beginning to a new sitcom life in the Big Apple.